St. James UCC Church, Lovettsville, Virginia. New York Times bestselling author Tim Rowland discussed Prelude to the Revolution: The French and Indian War on the Maryland-Virginia Frontier, as part of the Lovettsville Historical Society Lecture Series in 2016. Rowland described how this conflict, twenty years before the American Revolution, made our struggle for independence inevitable. Terror on American shores is not new, Rowland pointed out. A decade before the Boston Massacre, colonial farmers on the frontier lived in perpetual fear, knowing that at any time Native Americans might swoop down on their farms and families. The Indian motivations, however, might be easier to understand; they had allied themselves with the French who had promised the Indians to stop increasing encroachment and outright theft of their historic lands. 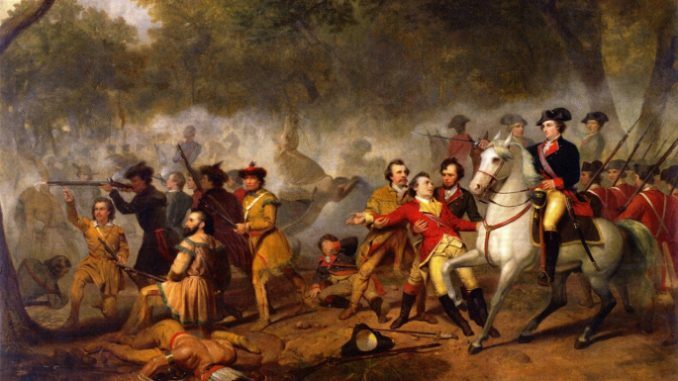 Although the settlers couldn’t have known it then, it was this war – known to us today as the French and Indian War, and in Europe as part of the Seven Years’ War – that made the fight for independence both possible and inevitable. This was in large part because the interests of the farming classes for more land, became aligned with the land speculators and merchants who wanted free access to the Ohio territories, as against the British who wanted to contain the American colonies on the Eastern seaboard. All along the foothills of the Appalachians, through New York, Pennsylvania. Maryland, Virginia and the Carolinas, an unheralded set of Founding Fathers were at work, who were every bit as crucial to Independence as the philosophers of Philadelphia and Boston. It was these settlers — sometimes known as our Founding Fathers from the Dark Side — made the American Revolution possible. Their story includes the first armed uprising against British regulars; ministers who preached with rifles leaning against their pulpits, and a string of home-made forts in which they desperately fought to hold their ground. Together, they stood not just against their Indian antagonists, but the government whose policies did nothing to ease their predicament. Tim Rowland is a columnist for The Herald-Mail newspaper in Hagerstown, Maryland, and author of several histories, including Strange and Obscure Stories of the Revolutionary War, which examines the drama that was playing out behind the scenes of the Revolution’s more famous battles and events.